Australians have a strong influence over the issue of wireless communication’s radiation safety and exposure standards. It all begun with Mike Repacholi, when he detached the non-ionizing radiation issues from the IRPA, formed ICNIRP and become its first Chairman, followed by the organization of the WHO EMF Project, of which he become Head, while retaining Chairman Emeritus post at ICNIRP. Still scientifically active Repacholi was, and is, followed by a number of other Australians and some of the currently most prominent EMF-influencers from the down-under are listed in the Table below. Australian influencers are not eager to talk to those scientists who, like myself, are questioning the scientific basis of the opinions of ARPANSA and ICNIRP. 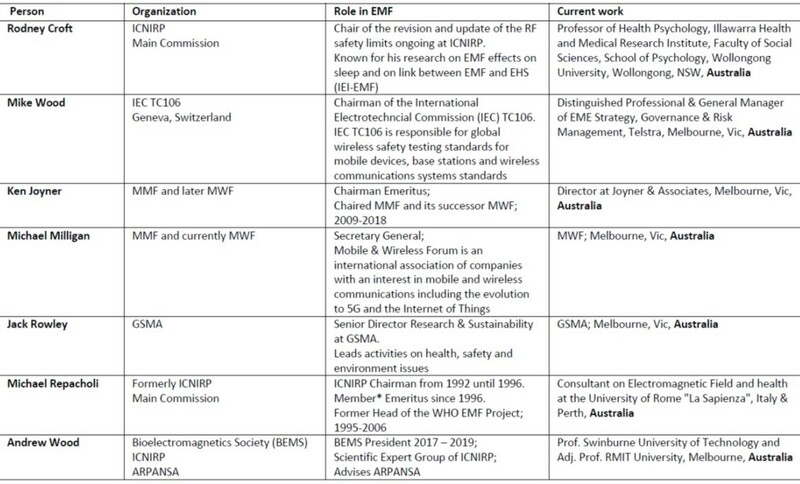 I have approached a number of the Australian influencers (all listed in the Table, with the exception of Andrew Wood and Mike Repacholi), as well as the Australian radiation regulatory entity – the ARPANSA – asking for meetings to discuss the issue of the possible/likely sensitivity of some persons to electromagnetic radiation, commonly known as electromagnetic hypersensitivity (EHS). The issue of sensitivity to EMF exposures that I consider as an example of individual sensitivity needs urgent attention. The exponential growth of wireless communications means that it will be impossible to avoid exposures after the full deployment of 5G networks. Furthermore, all people in order to properly function in the society are being forced to use wireless communication devices as all societal services are being transferred into wireless digital media. Simple statement “no place to hide” describes exactly what is happening. My contacting the Australian influencers led, in the end, to only one positive response. Rodney Croft agreed to meet me and discuss the EHS. Of other contacted persons, some of the persons did not respond to my repeated messages, some persons were traveling at the same time, one person had only time during the brief breaks in scientific conference, what would be complete waste of time as the length of discussion would not permit to present issue and get any reasonable discussion. Contact with ARPANSA was an interesting exercise in bureaucracy as well as in avoidance. On Sept. 27, 2018 I contacted CEO of ARPANSA, Dr. Carl-Magnus Larsson asking for a meeting with him and/or scientists at the ARPANSA to discuss the issue of EHS. I have attached to the e-mail my Open Letter on EHS. “… I would like to confirm that your open letter was received by Dr Larsson, and referred to the relevant area in ARPANSA. As you will be aware, the draft of the International Commission on Non-Ionizing Radiation Protection (ICNIRP) Guidelines on Limiting Exposure to Time-Varying Electric, Magnetic and Electromagnetic Fields (100 kHz to 300 GHz) has recently been released for public consultation. ARPANSA will be conducting a range of activities following the publication of these revised guidelines, including the revision of our own Radiation Protection Standard for Maximum Exposure Levels to Radiofrequency Fields – 3 kHz to 300 GHz. I can assure you that your views have been noted and ARPANSA will consider them as this work develops. ARPANSA remains committed to the continual review of research into the potential health effects of radiofrequency electromagnetic energy emissions from telecommunications sources, in order to provide accurate and up-to-date advice to the Australian Government and the Australian people. On Jan.21, 2019 I contacted ARPANSA again and asked what they thought of the opinions I presented in my open letter. It passed some 4 months since they received my Open Letter. Improving the methodology in provocation studies. “…I am not satisfied with your message simply stating that ARPANSA stands by its earlier opinion on EHS. In my Open Letter, to which you are now responding, I have listed five (5) specific reasons (flaws in design) why the results of the to-date executed psychological provocation studies are unreliable. I have also proposed what kind of physiological and molecular studies need to be performed in order to clarify whether there exists, or not, any causal link between EHS and exposures to EMF. However, in your official response on behalf of ARPANSA, there is no word about why the arguments presented by me were disregarded and what were the scientific reasons for this disregard. On Jan. 28 I resend my e-mail of Jan. 22, 2019, as the response from ARPANSA was not coming. In the end it looks like ARPANSA experts either did not read my Open Letter or read it and dismissed without even bothering to discuss correctness/incorrectness of my claims. This is, in my opinion, the reason why Dr. Karipidis was “unable” to provide any detailed evaluation, even brief one. The only thing that ARPANSA was able to say was, in my opinion, that ARPANSA stands by its (read: ICNIRP’s) opinion and does not bother to even consider opinions of others, questioning ICNIRP science evaluation. This exchange with ARPANSA has yet again shown how futile is to try debate science with organizations that have power to “stonewall” without consequences. We had a 2-hours face-to-face discussion but the outcome of it was pretty disappointing… At his request, I am not quoting exact responses from Dr. Croft. considering the fast approaching increase in exposures to EMF, due to the deployment of the 5G networks, where the base stations will be located very densely within the populated areas (outdoors and indoors) and, considering that people will be obliged/forced to use 5G because the proper functioning of a person in the society will demand the use of the wireless communication devices (all services will be available solely in the “wireless space”), with these two considerations – would it be now the time for WHO and ICNIRP to urgently recommend physiological studies on the effects of 5G-emitted EMF radiation on humans and living environment. The purpose of such research would be to find those, persons and living creatures, having higher sensitivity to the 5G exposures than the majority of the human population or inhabitants of the living environment. In principle, this philosophical view point is correct but… it is often used to dismiss the unwanted or the inconvenient research suggestions. So, it is in this case, Rodney Croft used this philosophical saying to trivialize and dismiss suggestion that EHS should be studied with methods of physiology instead of the currently used psychology. The research needs or gaps in the knowledge, are what the WHO EMF Project and ICNIRP eloquently describe as areas of EMF science where we are lacking the knowledge relevant to EMF impact on e.g. human physiology and molecular biology. The only way to offset existing research needs and gaps in the knowledge is to perform human volunteer studies, and not just extrapolate from the results of the in vitro or animal studies. EHS provocation studies executed using psychology methods where volunteers are asked what and how they feel, were originally designed by the researchers as the easy and simple way to prove whether there exists causality link between EMF exposures and the symptoms experienced by the persons claiming to be sensitive to EMF – the self-diagnosed EHS persons. Results of these psychological provocation studies were then used by the ICNIRP and the WHO to claim that EHS does not exist and that the symptoms are just an “imagination” caused by nocebo-effects due to scaremongering scientists and news-media. However, over the time, it appeared that persons claiming to be EMF sensitive (self-diagnosed as EHS), indeed experience health symptoms, often resembling symptoms of allergy or mental and emotional stress. Thus, around year 2004, there happened a shift of the opinion on EHS and its symptoms. Namely, WHO, ICNIRP and any/every scientific committee examining the research on EHS, begun to state that persons claiming to be EMF sensitive are indeed experiencing health symptoms that, in extreme cases, might be very severe. However, such opinions were, and are, always accompanied by a statement that while the symptoms are real and should be dealt with by the medical professionals, there is no link whatsoever between the symptoms and the EMF exposures. Any claims to the contrary are being dismissed and even ridiculed. Hence, the term EHS was replaced by less definitive term IEI-EMF, by the WHO and ICNIRP. As it appeared during our discussion, Rodney Croft was neither interested in recommending physiology-examining studies on EHS nor was he concerned about the contamination of the experimental EHS groups in EHS studies. The same, as he said goes for the ICNIRP – no need at all for ICNIRP to recommend physiological EHS research. In fact, Rodney Croft seemed uninterested in proving or disproving the causality link between EHS symptoms and EMF exposures. In his opinion, in research studies aimed at proving or disproving the link between EHS and EMF it is not important whether the volunteer has really EHS or is erroneously self-diagnosed as EHS. It is something new that has been developed in order to respond to questions about the contaminated EHS groups. Earlier, provocation studies were claimed to study whether EHS exists. Now, when the contamination was pointed out another explanation for provocation studies was defined – provocation studies are not looking to prove EHS but to find out whether self-diagnosis is correct or not. This psychological research approach by Rodney Croft and his team is something else from what I have asked about. I have asked for recommending/funding research that would demonstrate whether the exposure to EMF causes physiological symptoms that could be correlated with the physiological symptoms experienced by the self-diagnosed EHS persons. For Rodney Croft, the ubiquitous 4G and 5G networks and the fact that people are forced to use them in order to function in the society, it was not sufficient reason to recommend physiological research on individual sensitivity to radiation emitted by the 4G and 5G. Consequently, in Rodney Croft’s opinion there is no science to justify physiological research on EHS. It is Rodney Croft’s and ICNIRP’s opinion that the only research that can be recommended by ICNIRP is such where the research outcome might affect the safety limits. Physiological EHS investigations are not such safety limits affecting research, according to Croft. Apparently, for Rodney Croft and ICNIRP, research aiming to determine whether there exists physiological basis for the EHS symptoms would have no impact whatsoever on the safety limits. Very bizarre and completely wrong logic opinion from an experienced scientist. If research would show that some human sub-population reacts physiologically, on molecular level, differently from the rest of the population and if the level of radiation causing such responses would be below the current safety limits, then, automatically, safety limits would/should need to be reconsidered and likely adjusted to include this new information. Thus, physiological EHS research might have impact on safety limits. Such research would either confirm correctness of the current safety limits or would show how the safety limits should be revised. Without physiological EHS research we will never know whether there is a need to adjust safety limits to accommodate EMF sensitive persons. Two presentations at the 2018 Science and Wireless event in Wollongong were pertinent to the EHS issue. The EHS presentation by Adam Verrender and the 5G presentation by Mike Wood. Verrender’s presentation begun with the usual litany of how common the cell phones become (slide 2), how news media disseminates misleading and scaremongering information about EMF (slide 3) and listing of non-specific health symptoms that self-diagnosed EHS persons associate with the EMF exposures (slide 4). Presentation of types of research studies (slides 6 & 7) listed qualitative studies, epidemiological studies and laboratory provocation studies. It was stressed that none of the studies found evidence linking EHS symptoms with EMF exposures. From this part of the presentation, listener may got an impression that the laboratory provocation studies, performed using psychology methods, are the best research tool that is available. While Verrender listed some of the shortcomings of the qualitative or epidemiological studies, no shortcomings were pointed out for the laboratory (psychological) provocation studies. This is a biased omission. Slide 9 presented summary of the outcomes of the laboratory provocation studies performed with the psychology methods. It pointed out that self-diagnosed EHS persons are unable to recognize when the EMF is on and when it is off and that there are no differences between the occurrences of symptoms during sham and exposure experiments. It was also pointed out that combination of sham exposure with the belief of having EHS is enough to trigger symptoms. While the opinions in slide 9 are correct, they cannot be used as a valid scientific proof of lack of causal link between EHS and EMF. Firstly, fact that persons are unable to recognize when EMF is on and when is off, even though they may believe and claim to be able, is no scientific proof. Nobody is able to feel e.g. gamma-rays or ultraviolet. So, the naïve opinions of volunteers should not be naïvely taken by scientists and used as a naïve scientific proof. Furthermore, as Verrender stressed himself, belief of being EHS plays major role in how volunteers respond during tests. Therefore, simply, the answer to question “how do you feel” should not be automatically used as a scientific proof, when the answer might be, and likely is, affected by volunteers’ beliefs. These shortcomings of laboratory psychological provocation studies were omitted by Verrender, a serious bias in his presentation. Part of the Adam Verrender’s presentation (slides 12 & 13) was based on the recent publication of a provocation study examining electromagnetic hypersensitivity (EHS) (Verrender et al. 2017). It is what Rodney Croft and co-workers are heralding as new improved methodology of EHS research and it is what ARPANSA is recommending as the future of EHS research, the new improved methodology. Sadly, the whole research project, published as Verrender et al. 2017, is a major failure of the Wollongong’s team and their European collaborators/co-authors. The published article is an attempt to justify wasted funding for this major research project failure. According to the authors (Verrender, Loughran, Anderson, Hillert, Rubin, Oftedal, Croft) the study has employed an improved methodology to determine whether a causal link exists between the electromagnetic hypersensitivity (EHS) symptoms experienced in response to exposures to electromagnetic fields (EMFs). Similarly to other, to-date executed psychology provocation studies, also this study has failed to find any causality link. However, the severely flawed design of the study makes the final result scientifically unreliable. The only observation of the Verrender et al. (2017) is that it was not possible to find causal link between the self-diagnosed EHS and EMF exposure for the three (sic!) examined cases of the self-diagnosed EHS. However, in the first place, nobody knows, including the research team, whether any of the three examined volunteers had, or had not, the EHS. There are other problems with this study. In spite of setting up experimental environment to be as comfortable as possible for the study subjects, the experimental conditions do not eliminate the possible/likely “experimental stress/excitement” accompanying the experiment. Impact of such “experimental stress/excitement” on the obtained data is not known. Furthermore, scientists took it for granted that the self-diagnosed EHS, claimed by the patients, was a correct self-diagnosis. This is Catch22-like situation. How scientists can prove/disprove existence of EHS when they do not know if the particular examined study subjects are indeed EHS sensitive? This is why the results of the Verrender et al. are yet another example of practically useless research. The results apply only to three particular persons and to nobody else. The results do not disprove the existence of EHS as it is alluded in the study conclusions. The results suggests that the three volunteers might not be EHS, but it does not provide unequivocal proof of it because experimental stress might affect responses of volunteers during experiment. Result of Verrender et al. (2017) does not prove anything about EHS in human population. No, this is false statement. The authors do not know how the responses of volunteers were affected by the experimental stress. The conclusions of Verrender et al. (2017), as well as other EHS provocation studies, are likely influenced and possibly invalidated by the placebo and nocebo effects. Placebo and nocebo indicate the capability of the human mind and beliefs to affect the physiology of the human body (Benedetti et al. Neuropsychopharmacology 2011, 36:339-354; Tinnermann et al. Science 2017, 358:105-108). All persons volunteering in the EHS provocation studies, no matter whether self-diagnosed EHS or non-EHS volunteers, have certainly an opinion about the possible effects of EMFs on human health, no matter what this opinion is. In EHS provocation studies the participating volunteers (either EHS or non-EHS) have been asked how they feel, while exposed or sham exposed to EMF. The responses are very likely, or even certainly, “tainted” by the volunteers’ pre-existing opinions about the EHS and by the emotional stress caused by the participation in an experiment, no matter whether in laboratory or in volunteers home. Thus, data collected in the EHS psychological provocation studies is not reliable and objective but it is unreliable and subjective, based on subjective feelings. Claiming that such subjective data is scientifically reliable is incorrect. The psychological provocation studies are supposed to test the claims of EHS persons but they do not. There are no objective tests for EHS so scientists do not know what they are studying. Studies supposed to determine whether EMF exposures elicit symptoms are unable to do so. My conclusion: psychological provocation studies are unreliable in testing EHS. After discussing psychological provocation studies, Verrender moved to “scaremongering” studies that indicate nocebo effect is responsible for the EHS (slides 15 and onwards). “shut up and do not say a word that EMF might be harmful and EHS symptoms will go away”. Summa summarum, as a whole, the psychological provocation studies and nocebo studies are completely useless in proving, or disproving, causality link between EMF exposures and EHS. Continuation of such research is a complete waste of resources and time. Mike Wood depicted a very rosy future of the humanity using 5G. Most of the presentation repeated what he presented recently at conferences in Australia and at the ARPANSA. Slide 5 of Mike Wood’s presentation dealt with the exposure safety. Millimeter-waves, a novel kind of radiation that 5G technology will massively introduce to human environment were presented solely as an “old well known technology”… however, it was not mentioned that only ca. 200 biological studies were performed on millimeter waves and that there is absolutely lack of knowledge how exposure may affect human health as well as health of insects and animals. I sent message to Mike Wood asking to advise where I can find the “large number of studies on millimeter-waves” that he referred to in his presentation, but I did not get response. It is likely that there are indeed many studies on millimeter-waves but these are technological studies and only few are biological studies. 5G technology will be more efficient than 3G and 4G and people will be exposed to less of radiation… and this is the “proof” that 5G is safe – there is no biological testing of radiation effects, for engineers is enough to state that the emitted power is low = safe. Déjà vu! The same was said about low power emissions from cell phones in 80’s and, few decades later, radiation levels emitted by cell phones were classified as possible human carcinogen. Summa summarum, there is no assurances that radiation exposures from 5G will not cause health effects because the issue was not studied by scientists nearly at all. Safety of 5G propagated by ICNIRP and telecom industry is based solely on assumption that low power does not cause health effects. This is not enough.